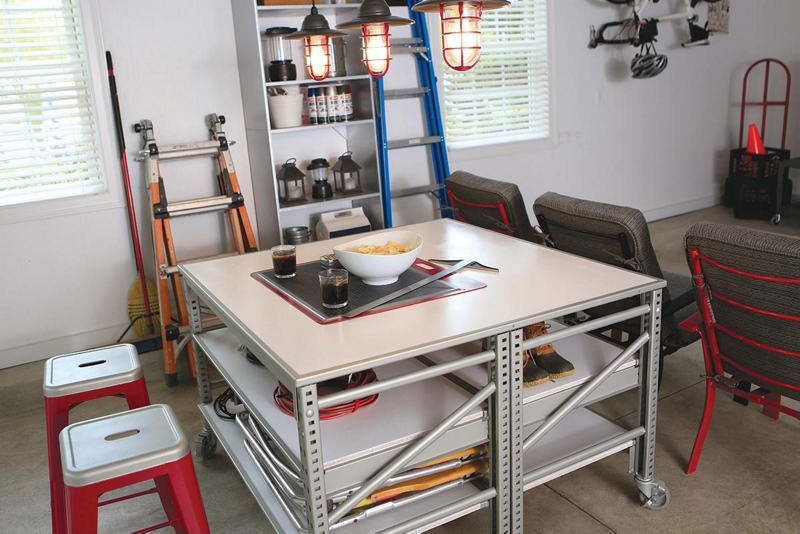 Turn your old workbench into a work station with the help of Krylon® Rust Protector™ Metal Finish - Satin Nickel and Rust Protector™ Gloss Enamel - White. Using an all-purpose cleaner/degreaser, wipe down the entire workbench to remove all dirt and grime. Rinse thoroughly with water and allow to dry. Prep surface by sanding any rough areas. If there are areas with flaking rust, use a wire brush to remove it. Wipe clean. Applying in a well-ventilated area, begin painting the top work surface of the workbench, holding the can of Krylon® Rust Protector™ Gloss Enamel - White 6-8 inches from the surface and paint using a sweeping side-to-side motion with slight overlap. Allow paint to dry, less than one hour, and cover top work surface area with paper and painter's tape to mask. Begin painting at the top of the metal workbench sides and legs, holding the can of Rust Protector™ Metallic Finish - Satin Nickel 6-8 inches from the surface, and paint using a sweeping side-to-side motion with slight overlap. Once fully dried, remove painter's tape and paper masking from top work surface area.